Does your cat lie around all day merely waiting for mice to walk by? 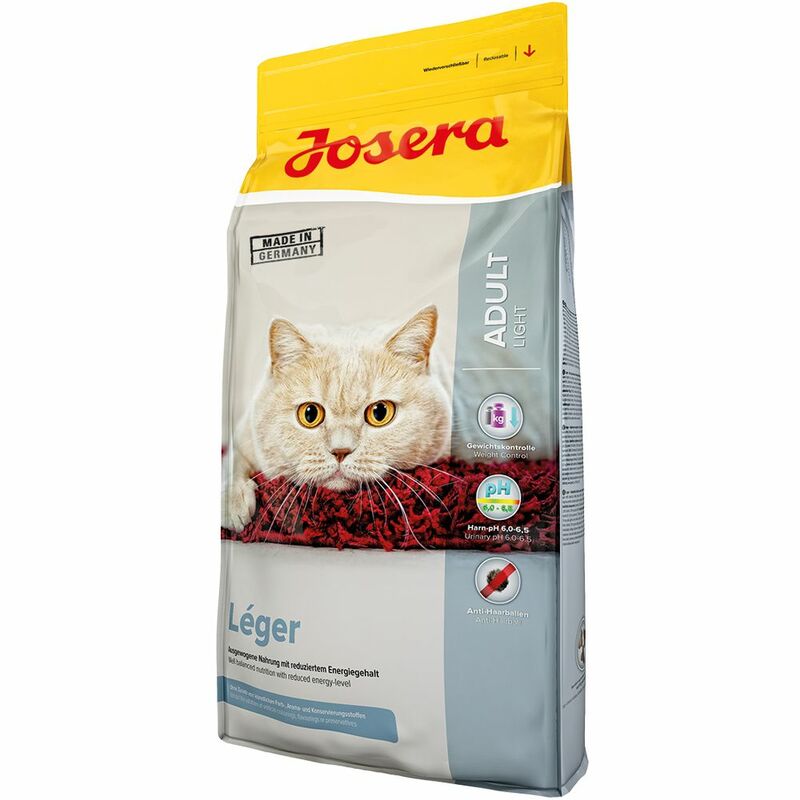 Josera Emotion Leger Cat Food with reduced fat is the best choice for cats who are leΒ active, or cats, for example, who have put on weight after sterilization. The rich content of fibre in Josera Emotion Leger Cat Food ensures that your cat will feel satisfied by relatively smaller amounts of food. With regular meals of Josera Emotion Leger your cat will achieve gradual, healthy weight loΒ. Josera Emotion Leger Cat Food is optimally tuned to your cat's needs. The resealable bag guarantees your cat's food will stay fresh. Anti-Hair Ball: Your cat spends a large part of its day grooming itself. He/She will often swallow single hairs that can eventually collect into nasty hair balls. Special dietary fibre in Josera Emotion Leger Cat Food allow this hair to progreΒ further through your cats digestive tract in order to prevent the formation of hair balls. Weight Control: dietary fibres make your cat feel more full. The increased protein content also stimulates the metabolism and L-carnitine supports digestion pH-Control: The careful selection of ingredients ensure an optimal Calcium-Phosphorus ratio and a reduced level of magnesium. This creates an optimal pH-balance in your cat's urine and also prevents the formation of urinary stones. Vitality: the addition of high grade protein aΒures easy digestion resulting in reduced amounts of vomit.